Long-term power cuts, destruction of electronic devices and increased cancer risk for aeroplane passengers are all potential effects of the Earth being hit by a powerful solar eruption. 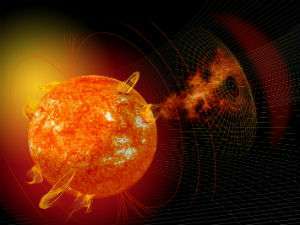 Yet, new research has found space scientists have their work cut out to predict when these coronal mass ejections (CMEs) are on a collision course with Earth. A study of CMEs by scientists at the University of Reading has found they have cloud-like structures. This means they are more influenced by solar wind, through which they pass to reach Earth, making their movements much harder to predict than if they were single bubble-like entities as was previously thought. CMEs are huge blasts of solar plasma and magnetic fields from the sun's atmosphere that can reach Earth in one to three days. A direct hit could have catastrophic consequences, as CMEs are capable of damaging satellites, destroying electronic devices and potentially exposing people at high altitude, such as astronauts and aviation crew and passengers, to cancer-causing radiation. They occur frequently, but predicting which ones will impact Earth and how severely is difficult. Professor Mathew Owens said: "Up until now, it has been assumed CMEs move like bubbles through space, and respond to forces as single objects. We have found they are more like an expanding dust cloud or sneeze, made up of individual plasma parcels all doing their own thing. "This means that trying to predict the shape and movement of CMEs as they pass through the solar wind becomes extremely difficult. Therefore if we want to protect ourselves from solar eruptions, we need to understand more about the solar wind." The new study, published in Nature Scientific Reports on Friday 23 June, looks in detail for the first time at how CMEs behave as they make their way through space, and how they interact with external forces like solar wind. The Reading scientists took a cross section of a CME to examine its structure more closely. They found that a CME quickly reaches the point at which the speed of its expansion exceeds the speed at which information can travel within the CME. At this point, it ceases to be a coherent structure, so any distortion to one part of the cloud caused by external forces does not affect it as a whole. Scientists are constantly monitoring the sun to track solar wind and extreme space weather. The Reading team recommends that information about solar wind should be incorporated into CME observations to ensure we are fully aware of the threat they pose to Earth. A previous study by University of Reading scientists found a shift in solar activity, expected to occur by the middle of the century, could make us more vulnerable to CMEs, as well as concentrating the Northern Lights around the poles – out of view of Great Britain. In 2011, the threat of space weather was added to the Government National Risk Register of Civil Emergencies. In the past, CMEs have been implicated in mass power grid outages, and lesser effects on communications. Unfortunately predicting their effects on the Earth's magnetosphere appears to be like predicting where a hurricane will go or where a mesocyclone will deposit tornadoes. I don't expect much of this effort yet but we will have to gather much more data to make any useful predictions. We have not been hit by a really big CME, one that is rare but still inside the bell curve. That would be a catastrophic event. We have not? What about the 1859 "Carrington event"? If that doesn't qualify as "a really big CME, one that is rare but still inside the bell curve", your bell curve is off. FSC graces us with a strawman, red herring (among other logical fallacies), and an utter pathetic display of plasma ignorance to ultimately say nothing of any substance whatsoever. Should anything else be expected?